The National Palace Museum is found in Shilin district of Taipei. This magnificent structure designed by Huang Baoyu looms against a backdrop of lush vegetation. The museum, which has one of the largest collections in the world, is home to 677,687 pieces. These ancient pieces transcend 8,000 years of China’s rich history up to the Qing Dynasty, and many of them came from the collections of Chinese emperors. The museum was established in Beijing in 1925. Because of Japanese invasion, the important contents of the museum were removed in 1931 and brought to different places to keep them away from the Japanese. Years later, the ongoing conflict between the Chinese Communist Party and the Nationalist Party led the museum directors to transfer its most valuable contents to Taiwan. However, the pieces that reached Taiwan were only about 25% of the original collection that was transferred from Beijing. Fortunately, they included some of the best pieces from the original collection. The National Palace Museum that now stands in Taipei was constructed in 1964 and was finished in 1965. Because it did not have enough room to keep more than 670,000 artifacts, it underwent a series of renovations in the following years. It went through a major renovation in 2001 to give it more space and upgrade it with more modern facilities. The overhaul cost $21 million and took years to complete. Only a third of the museum was open to the public during that time. Finally, the renovation was completed in 2006, and the museum was reopened. Visitors from all over the world now admire its striking grandeur. The museum’s collections are classified into antiquities, painting and calligraphy, and rare books and historical documents. Permanent exhibitions of antiquities are found in Galleries 207, 201, and 205 and also in Galleries 304, 305, 306, 307, and 308. Permanent exhibitions for painting and calligraphy collections are found in the second level of the west wing. Permanent exhibitions of rare books and historical documents are found on the first level of the east wing and the west wing. If you are visiting the National Palace Museum, it is best to start your tour at Room 102, the Orientation Gallery, so you can read some interesting information about the museum and its displays before heading off to the different galleries. The museum’s displays are rotated every quarter. Not all the 677,687 pieces are displayed at one time; the museum only puts 60,000 pieces on display every three months. The museum’s main building is open daily from 8:30 am to 6:30 pm, with extended hours until 8:30 pm every Saturday. If you are bringing kids aged 7 to 12 years old, you can take them to the Children’s Gallery where they will enjoy interactive exhibits and short, entertaining, and informative shows in the orientation theater. The Children’s Gallery follows the same schedule as the main building except that it closes at 1 pm on Wednesdays. 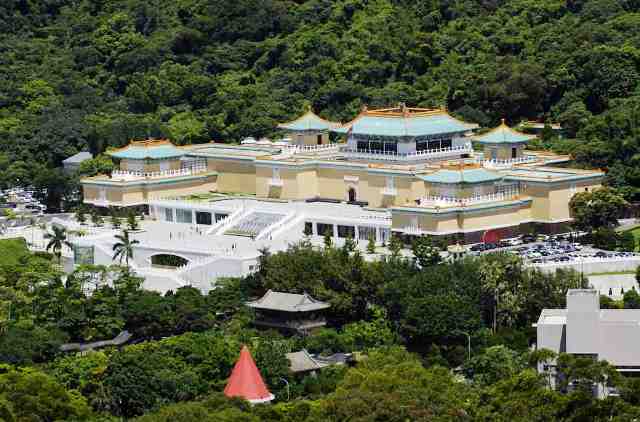 The National Palace Museum’s library is a must-see for any book lover and student of history. It has a rich collection of rare books, archives from the Qing dynasty, and numerous periodicals. You can reach the National Palace Museum by taking the MRT Danshui Line all the way to Shilin Station. From there, you can take bus R30 and go down at the museum. You may also take the MRT Wenhu Line and go down at either Dazhi Station or Jiannan Rd. Station. If you choose the former, you can take bus B13 from the station. If you take the latter, you can take bus B20.